This lovely recital – it feels much more than a simple collection – is a winning blend of what looks at first sight to be traditional Scottish and Irish music and some stylistically related new compositions. However, it is much more geographically wide-ranging than that; there are original compositions from a Swede, a Belgian and a fiddler from the Norse end of Scotland; not to mention the two (French and German) excerpts from Baroque suites which do not seem out of place at all. The level of musicianship on show here is extraordinarily high, especially in terms of how the tracks have been assembled and how the instrumentation – always apt and never gimmicky – is designed. This is done so cleverly that the result is wholly transparent and there is a natural flow both across the whole CD and within each individual track. Each of the sets (‘medley’ doesn’t seem the right word), typically led by one of the solo instruments, is beautifully put together. A good example is the “Sitting in the Stern of a Boat” set, led by fiddler Ryan McKasson. The violin states the haunting tune of that old Scottish air alone, with the viola da gamba – absolutely the right bass instrument for this music – joining with fitting counterpoint. Then the harp joins in with the violin double-stopping, a powerful effect. This already substantial piece would have made a satisfying track on its own but there is more to come. The jaunty “Whistle O'er The Lave O't” – originally a song by Robert Burns – ups the tempo slightly before it really gets going with fiddle accompanied by bodhran in three quick numbers. The first two are taken from Gow’s "Repository of the Dance Music of Scotland" and the track ends with an original composition by McKasson himself. Pacing and proportions are finely calculated. Isaac Alderson’s uillean pipes come into their own in the Irish group that follows. Again, the proportions of the set satisfy, with a lament followed by two boisterous dance tunes. The Celtic harp gets its turn as soloist in the Shetland fiddler Jenna Reid’s tune ‘Douglas and Fiona Shearer’. While the liner notes say nothing about this sweet air, the composer tells me that it was written for the wedding of friends. Several other tunes have personal dedications; Jackie Moran’s contributions are for his wife Amy – a lovely flute tune – and daughter Sophie. Sue Richards’ harp solo “Miss Abbott” is for her mother. Carolyn Surrick’s attractive “Lindsay’s Keys” celebrates another wedding while “Ginger’s” refers to a sometime member of the ensemble. Other personal connections figure in the selection of pieces by fellow folk musicians – Enda Scahill (Ireland), Guido Piccard (Belgium) and Roger Tallroth (Sweden). The ‘early music’ inclusions work very well in the context. The Divisions for violin by Davis Mell on “John Come Kiss Me Now”, a Scottish song dating from as early as 1570, get a virtuoso performance from Kathryn Montoya, a stalwart of various baroque ensembles in the USA, on recorder and Jackie Moran on bodhran, a perfectly logical accompanist. The Marais embodies the dance theme that permeates the CD; this and the excerpt from Telemann’s sonata for viola da gamba are pieces from Carolyn Surrick’s playing history. The harp is right in the continuo part and the transition into a folk tune from the Swedish province of Jämtland is absolutely delightful. In the liner notes, Carolyn Surrick tells you very little about the music, preferring to meditate on the background of the musicians. 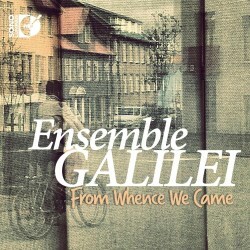 Only the ensemble name and the cryptic phrase “From Whence We Came” (perhaps this is not ungrammatical in the USA) appear on the front cover with nothing to give you a clue about what’s inside. The notes suggest that this is the point, that the history of the ensemble, its personnel and experiences are what the CD is about. More meta-information than information, perhaps, but a good starting point for tracking down the references to composers and collections of traditional songs. As an inveterate researcher, that’s fine for me though not all potential buyers may feel this way. A lovely blend of folk tunes, early music and original compositions showing a high degree of musicianship.